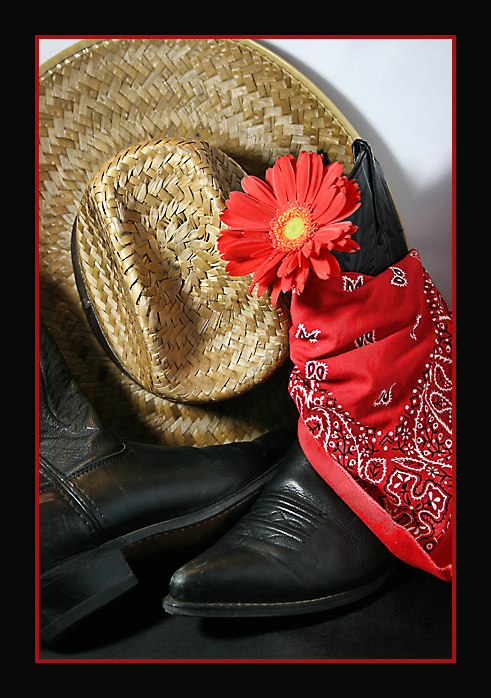 Borrowed boots, bandana, and hat, purchased flower. The boots were scuffed and I thought that scuffiness added to the feeling of losing Sean. Unsharp mask, removed a few dust marks, light application of LucisArt. Save for web. In honor of our fallen cowboy: Sean Michael Matos. This shot is not the greatest, however, the thought was there. You will be missed. Post challenge: I know I'm in the minority, but I liked the shadow and the white background and purposely kept both. Great minds, think alike. (You know what I mean.) I like your composition and the red makes a very nice still life. I'm not crazy about the white wall. Since this was advanced editing, I might have added a little color there to tone it down. My other thought on this, as a challenge entry, is that it might be a little too cheerful for a memorial image. Interesting take on the challenge. I'd personally like to see more of the left hand boot. I'd also like to see a far less prominent border as it really draws the eye away from the elements in the frame. Aiiieeee! Another "equipment" shot. Sorry - seems to be quite a few like this one in the challenge. :-] As a still life type photo it's ok. The white background stands out a bit too much IMO and is really showing the shadows. The lighting (evident on the boots and hat) is a tad harsh and could be diffused some for better effect. All JMO of course. :-) Good luck in the challenge. Proudly hosted by Sargasso Networks. Current Server Time: 04/19/2019 02:19:01 AM EDT.